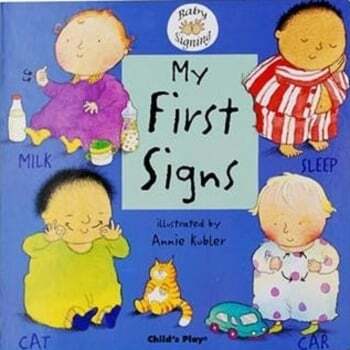 My First Signs (Board Book) - Children are able to communicate by signing before they develop the skills necessary for speech. By teaching sign language to children from as young as seven months we can help them to convey their emotions and their needs. This first signing guide for hearing and deaf children contains over 40 key signs. Designed for parents and carers to share with babies, with its simple and clear instructions and endearing illustrations, this book is an ideal introduction to signing. A helpful tip is given at the bottom of each page to help beginners get started. Makaton compatible.